I wouldn’t say I’m a creature of habit but when it comes to tea or coffee I have my favourites which meant I hadn’t tried anywhere new for a while. This weekend however I found myself trying 3 new places in quick succession. I’ve often poked my head down Cobden Chambers and thought it might just be full of treasures. On closer inspection the outlets ranged from boutique jewellery, to vinyl shop to hair salon. The only one to really interest me was a little lunch location, Kiosk. Inside is bright and functional but as it was a nice day it wasn’t as appealing as the picnic tables outside. There wasn’t huge amount of choice on food but what they did have all sounded like something you would want to eat. My eye was caught by a slow cooked lamb flatbread that I hoped was substantial enough to justify the £9 price tag. It really looked the part, a dash of vibrant green sauce added more in the way of visuals but the herby flavour was good too. The meat fell apart and had a deep flavour that really worked well with some sweet potato that had been cooked with some fragrant spices. You couldn’t want much more from a lunch in the sun. It may have been a product of being outside but we did have to head back in to remind them about some drinks we had ordered. After efforts in tracking it down I didn’t enjoy my fizzy strawberry number overly, reminiscent of strawberry flavoured water rather than having any fruit flavour. The latest news from White Rabbit is that two have become one. The Houndsgate location has been taken over by a new vegetarian café called No12 that will be opening soon. Their site down Bridlesmith walk remains and becomes the flagship. It is decked out quaintly in traditional tearoom regalia with a handful of tables in the alleyway, a pleasant outside space where I ended up sitting. There was an appealing display of cakes and the chocolate one was recommended which I went for along with a pot of Assam tea. As if the cake wasn’t decadent enough it arrived with some clotted cream, the serious stuff. It worked rather well as it took the edge off the rich chocolate and although the cake was already moist it did enhance the texture too. It was a hefty slice (£3.40) that came too close after that lamb flatbread and I’m ready to admit I didn’t finish it! The tea was nice enough but just a bag where loose-leaf is usually better in my experience. I didn’t get forgotten about sitting outside mind you which was a plus after earlier. 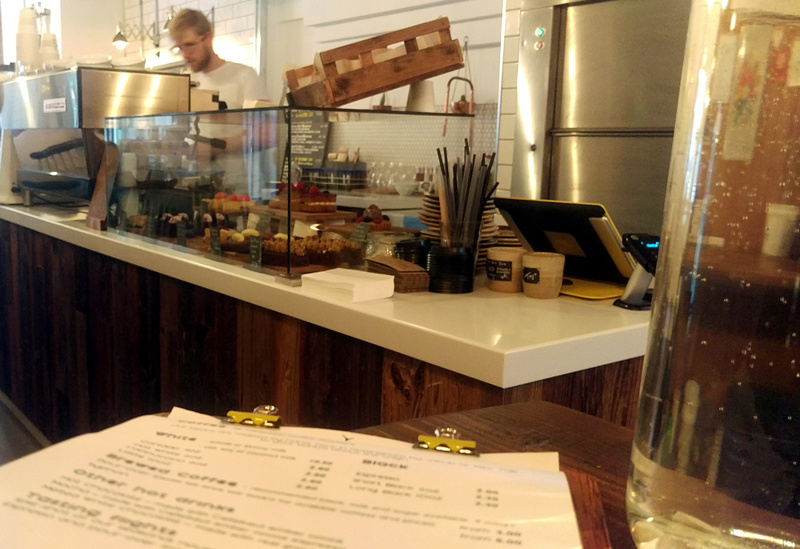 Sitting inbetween the Italian chains of Caluccio’s and Jamie’s Italian on Low Pavement is Cartwheel, a cafe much more in the contemporary hipster vibe. Exposed woods, tea served in conical flasks to name just 2 tell-tale signs. The first I had heard of them was when they won best Café at the Nottingham Post Food and Drink Awards so I was expecting good things. A chorizo (and other nameless sausage) focaccia (£5.50) was rather excellent. Good bread and plenty of the sausage filling was complimented by a little sweet chutney / sauce and crisp, crunchy iceberg lettuce. Unfortunately the same couldn’t be said for the coffee, my Cortado (£2.60) was decent but not in the league of 200 Degrees. It somehow didn’t have as a strong a flavour but was more harsh. I did hear the tea was great so perhaps got unlucky and its definitely somewhere I’d be happy to return. So three cafes, three scores of 7.5 but for very different reasons. They each bring something that means they are worth a visit. Nottingham’s café culture is in good heath it seems, there are a couple more still on my list but let me know if you have any recommendations!